View New Orleans 2019 on zzlangerhans's travel map. New Orleans may get all the press, but the heart of Cajun country is the smaller and lesser known city of Lafayette. 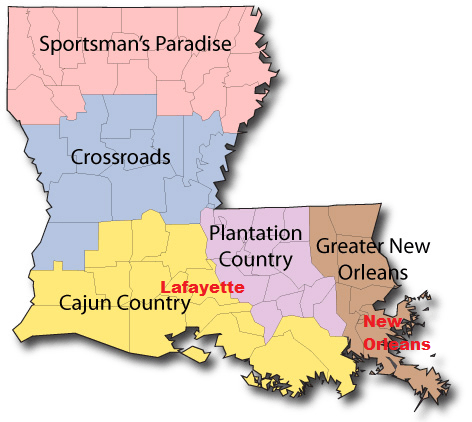 The official name of Cajun country is Acadiana, and it extends across the southern part of Louisiana from the western edge of New Orleans to the Texas border. That's right, New Orleans isn't even officially included in Cajun country. The name Acadiana is derived from the region of Acadia in the Northern Atlantic coast which included the French colonies that eventually became Quebec. When the British conquered Acadia in the early 18th century, many natives migrated to the French colony of Louisiana which was of course eventually purchased by the United States. 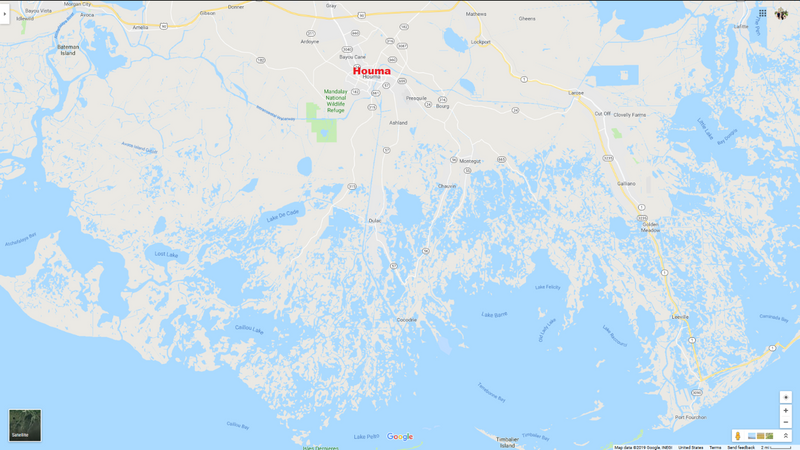 The area in which the Acadians settled became known as Acadiana, and the word Acadian was eventually corrupted to Cajun. Cajun is a genuine subculture of the United States, having their own language, music, and cuisine. Lafayette became the center of the Cajun community when the governor of Louisiana in the mid 18th century began actively settling Acadians in the area, granting them land among the bayous. Our Airbnb in Lafayette was an unassuming but spacious house close to the center of town. There was a large backyard with banana trees and a beat up soccer ball that kept the kids entertained for an hour until it was time for dinner. One might think at this point that we'd had our fill of crawfish for the day, and one might be wrong about that. The most popular boil in town was a hole in the wall in a strip mall, but their crawfish were huge and spicy. Mei Ling had figured out by this point that the right way to order the crustaceans was in five pound portions, and I eventually had to cut her off much in the same way I've dragged friends out of bars in my younger days. After dinner we went to a couple of bars downtown in search of Zydeco music. This unique musical genre fuses accordion with traditional rhythm and blues instruments to create a sound that is emblematic of Acadiana. Unfortunately there was nothing going on Sunday night and we retired to the Airbnb empty-handed. In the morning we walked to downtown for breakfast, passing several trees that were still festooned with beads from the Mardi Gras parades three weeks earlier. Thankfully we were able to get through breakfast without any crawfish making an appearance. We drove half an hour south to Avery Island to visit the Tabasco factory. This was an odd choice because neither of us particularly cares for Tabasco sauce. I used to put it in soup when I was younger before I discovered more textured hot sauces like Sriracha, but now it just tastes like fiery vinegar to me. We were more interested in Jungle Gardens, the botanical garden adjacent to the factory that can be toured by car. Avery Island isn't an island in the typical sense of the word as it is only separated from the land around it by narrow bayous. Tabasco sauce has been manufactured on Avery Island since the mid-19th century. The Tabasco factory itself wasn't very exciting but fortunately we weren't pressed for time and just let the kids figure out different ways to amuse themselves. The good thing about our kids is that it's almost impossible to get bored when they're around. Jungle Gardens made the trip down to Avery Island worthwhile. A gravelly road took us along the bayous through stately trees decked in Spanish moss. At one point we parked the car and walked through a forest of palm trees and bamboo that seemed almost prehistoric. On the way back to Lafayette we stopped in the town of New Iberia for more huge crawfish. Mei Ling's Bloody Mary came with a whole deep fried soft-shelled crab on top. Tuesday morning we got started with a boat ride with Champagne's Cajun Swamp Tours outside of Breaux Bridge. For about an hour and a half we motored gently through the bayous, some of which were still enough to reflect the bald cypresses that surrounded us and others which were covered by an unbroken green carpet of algae. The highlight was the enormous alligators that were basking in the sun, seemingly oblivious to our presence. After lunch in Breaux Bridge we got back on the road and soon arrived in Baton Rouge, the capital city of Louisiana. While Baton Rouge is far smaller than New Orleans, it boasts some beautiful buildings including the Old State Capitol building. This 19th century Gothic-Revival castle is now a museum of political history. We took a short drive around the city center and saw some charming residential neighborhoods with classical Southern mansions. Once we left Baton Rouge, it was time to say good bye to Louisiana for a couple of days as we headed north to Mississippi, the second state of our trip. I spend a lot of time writing about our road trips in Europe, but the truth is we have just as much fun traveling in our home country of the US. I've tended to ignore these shorter trips on my blog but recently decided I was going to try to write up every trip as soon as possible after coming home so I would remember as much detail as possible. From the perspective of travel, the US is more like China than a European country. Because of its size the regions are more diverse but they're not all accessible from each other on a single trip. Also, much of the diversity is confined to the cities. 90% of the rural areas are actually quite similar culturally even if they have their own special attractions. That's why I groan every time a European tells me about a big plan to drive from the East Coast to the West Coast. They're buying themselves a whole lot of monotony between interesting stops. The best way to see the US is to carve out regions that have their own individual culture as well as interesting cities and focus on them for a week or two. We've done that before in New England, Southern California, the Deep South, and Pacific Northwest. This time round we only had a week for the kids' spring break so we looked for a place close to Miami and settled on New Orleans and Cajun Country. 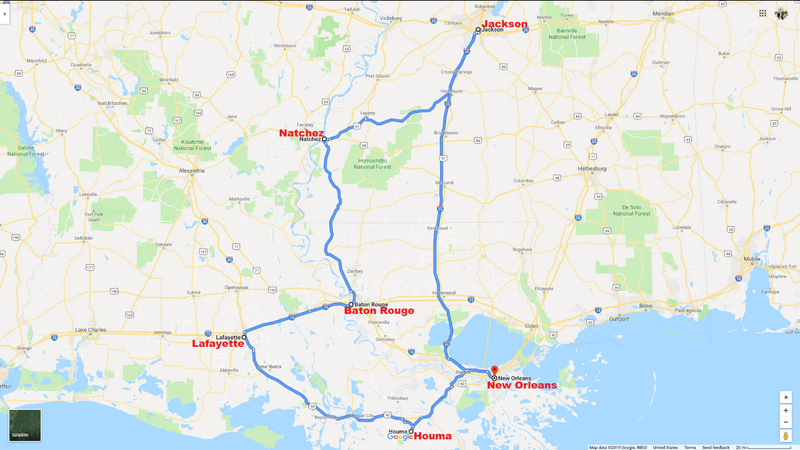 That's a fairly small area so I decided to expand the itinerary to include southern Mississippi, which is a bastion of cotton belt culture. We caught an early morning flight which got us to New Orleans at ten in the morning. We picked up our minivan and drove straight to the Louisiana Crawfish Festival in the eastern suburb of Chalmette. Peak crawfish season is March through May, and during that time there are crawfish festivals practically every weekend in Louisiana. Mei Ling and I both love crawfish, although I'm hard-pressed to explain why I prefer them to something more common such as shrimp. I think the attraction is largely in the process of extracting them from their shells which crack in a very satisfying way, followed by the salty umami of sucking the liver out of the head. The main thing that distinguishes one crawfish from another is the size and the quality of the boil. If you've had boiled crawfish before and you weren't impressed, odds are you were served the typical small specimens served in restaurants outside of Louisiana, or even frozen ones. Even in New Orleans the restaurants in the more touristy areas tend to serve the diminutive type. Traveling in rural bayou country proved to be an eye-opening experience in that regard. The festival was set up in the enormous parking lot of the local civic center. At one end was a stage and just as we arrived they were holding a crawfish eating contest for a group of local beauty queens. Most of them ate like they didn't particularly care to win first place. Following that they moved over to a large square table for a crawfish race. The girls slapped their hands furiously on the square table, trying to get a crustacean to crawl over to them. There were plenty of food stalls but only one with the star of the day, freshly boiled crawfish. We made short work of two heaping cartons, washed down with ice cold beer. After lunch we took the kids over to the carnival rides and let them have some fun with the Ferris wheel and bumper cars. The festival had been the perfect way to kick off our road trip. It set a tone for good food and energetic fun that we planned to sustain for the whole week. Instead of taking the direct route west to Lafayette via Interstate 10, we detoured southward through bayou country and the town of Houma. I wanted to get a little closer to the amazing Louisiana coastline, which looks like it was attacked by gigantic land-eating moths. The other attraction in Houma was that it was home to some of the most renowned crawfish restaurants in Louisiana. We had just stuffed ourselves at the festival a couple of hours earlier, but we decided to make a stop at Cajun Critters anyway. It was a folksy restaurant with a lot of nautical decoration and politically incorrect placards in the restrooms. Besides the obligatory crawfish, we ordered gumbo and oysters which turned out to be meaty and delicious. We were fortunate to be there during oyster season, which runs from Labor Day through the end of April. The Gulf of Mexico is home to many varieties of oyster and Louisiana boasts the largest remaining oyster reefs in the world, despite the Deepwater Horizon oil spill of 2010. The crawfish were larger and tastier than the ones we'd had at the festival. Somehow once we saw the food it was like we hadn't eaten at all that day. We drove around the town of Houma, using Zillow to guide us to the neighborhoods at different economic levels. The best neighborhoods were immaculately maintained with beautiful houses that cost about a third of what they would in Miami. Our favorite was one that was festively decorated for Easter in a more blue collar area. 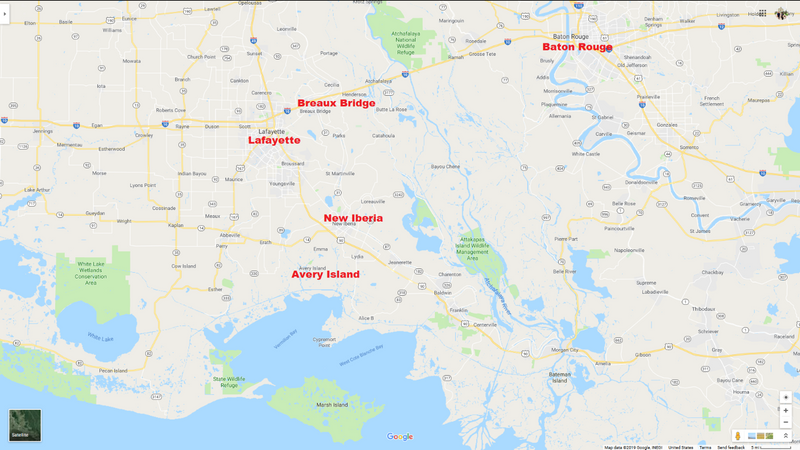 I tried to figure out a way to explore the myriad bayous and islets that form Louisiana's tattered coastline by car and couldn't come up with anything. There doesn't seem to be much for travelers down there aside from fishing trips and airboat tours. The few roads that extend all the way to the shore seem to pass mainly through unattractive industrial areas. Instead we decided to press on to Lafayette and check into our Airbnb before it got too late. View Iberia and Southwest France 2018 on zzlangerhans's travel map. We didn't waste any time leaving Bordeaux because the market in Cap Ferret had the reputation for being one of the best in the region. What we hadn't counted on was the horrendous traffic on the D106 on Saturday morning. It seemed like everyone in Bordeaux was headed for the coast for the weekend, and once we reached the peninsula the highway turned into a parking lot. It took more than an hour to traverse the last twenty kilometers. The market had a large outdoor area devoted to clothing and crafts with just one small building to house the meat and produce. The area was crowded with domestic and English tourists and didn't have a very authentic feel, although some of the artwork was fun and original. There wasn't anywhere to sit and eat inside the market so we found lunch at a seafood restaurant in town. Despite being directly across the mouth of Arcachon Bay from our next destination, we had to drive for another hour and a half around the bay to reach our next destination due to the lack of a car ferry. I knew the long drive to Dune du Pilat would be worth the trouble since I could still remember visiting the gigantic dune from my own early childhood. I'd been looking forward to surprising the kids with the enormous mountain of sand for the whole trip and I wasn't disappointed. As soon as we reached the end of the short trail through the woods and they looked up at the dune, their jaws dropped. It takes a lot to impress my kids but the Dune du Pilat definitely did the trick. Once we'd clambered to the top the views around us were breathtaking. Inland was a forest canopy that extended to the horizon, and from the other side we could see across the bay all the way to Cap Ferret where we'd spent the morning. It was a great reminder that the natural world has as much to offer the intrepid traveler as the urbanized one. We'd already seen a lot but the day's excitement was far from over. 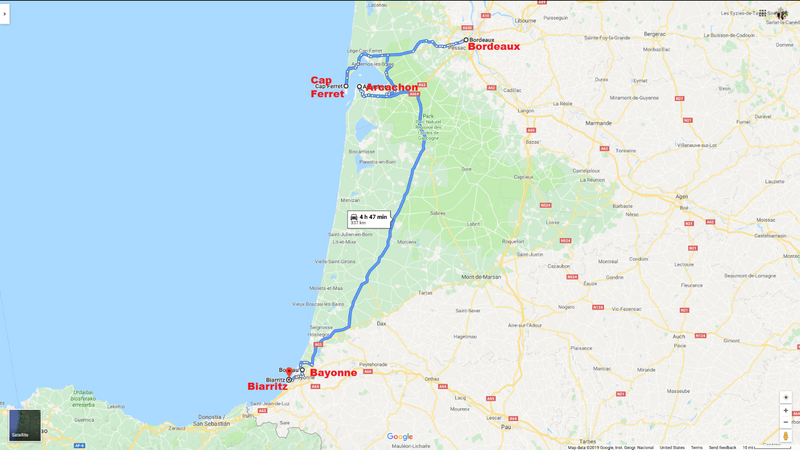 While the kids slept and shed sand in the back seat of the car, we drove south towards French Basque country where we were planning to experience the last day of the annual Fêtes de Bayonne. Although this five day event is the largest annual festival in France, it's barely known internationally. I only learned of it myself when doing my customary search for local events along our planned itinerary. Even though I reserved our accommodations months in advance, I was only able to find an Airbnb in the neighboring town of Boucau. We were lucky to get that as it was one of just two Airbnb's left in a ten kilometer radius around Bayonne. 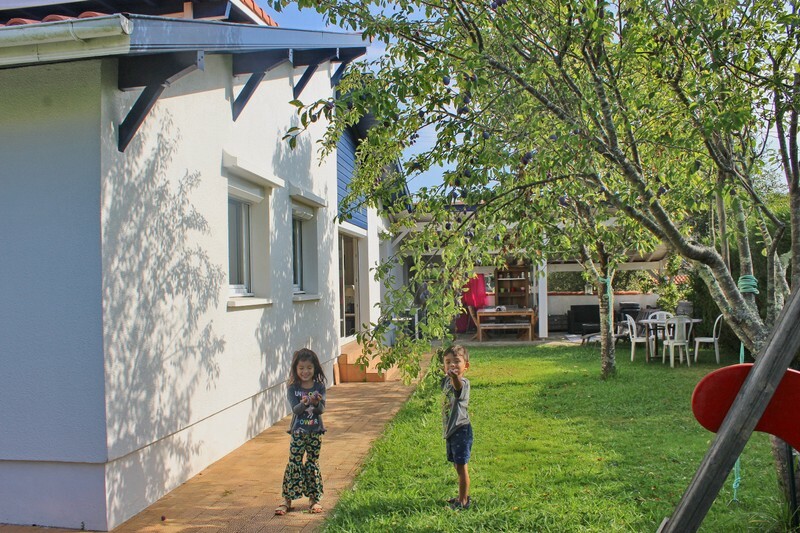 The house in Boucau turned out to be a great spot with plenty of outdoor space and a damson plum tree whose branches were bowing with fruit. We gave the kids about an hour to stretch their legs in the yard and play with the swings and then girded ourselves for a long night of partying. We didn't know what to expect from the Fête but I've had enough experience with massive outdoor festivals to know that we weren't likely to be ushered into a prime parking spot ten yards from the entrance. On the other hand, we were nowhere near within walking distance and public transportation seemed highly unlikely. Ride share might get us there and then be impossible to find once it was time to go home. That meant we had to get as close as we could by car and hope there would be somewhere to park that wouldn't require an interminable trek by foot. 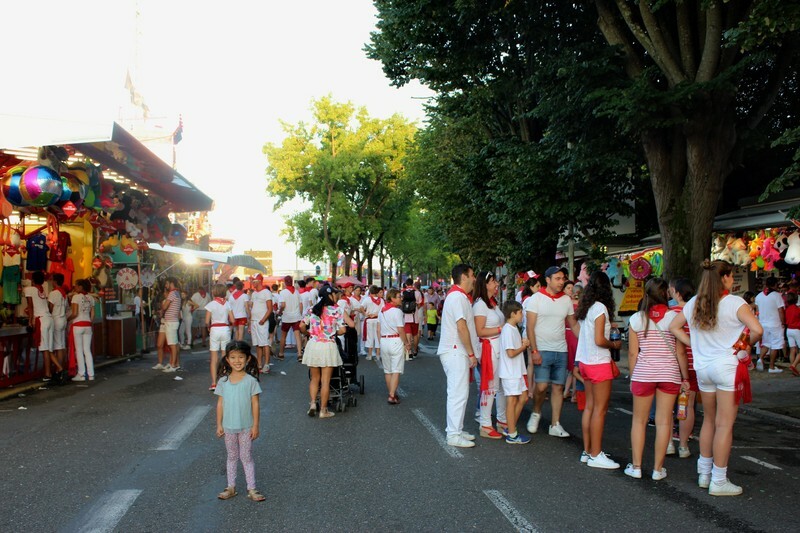 Pretty soon after leaving Boucau we started to see young people in the traditional white outfits with red scarves inspired by the more famous Fiesta de San San Fermín in Pamplona. At one point a crowd of kids about twelve to fourteen years old blocked the road. One came to the window and, after ascertaining our nationality, requested two Euros in halting English for the privilege of passing. In another context that might have annoyed me but the kids weren't old enough to be threatening so I just handed over the coin and was allowed to pass through. There was quite a lot of traffic once we got to the bridge over the Adour River and I briefly considered parking inside the roundabout but decided to press on. Both banks of the river were crowded with tents and once we got to the Bayonne side parked cars were lined up on each side of the road as well as in the middle. We drove around a little and eventually found a spot a little off the road that didn't seem any more illegal than where hundreds of other cars were parked. We had about a ten minute walk to the town center where the first thing we found was a carnival with typical rides and fast food. Of course, there's no way to get kids through a carnival without allowing them to do some rides so we let them have a few runs on the giant slide. We didn't feel like eating the junk food so we managed to get them past the rest of the rides with the promise that we would come back after dinner. Downtown Bayonne's main drag, Rue Thiers, was crowded with outdoor restaurants. Despite the crowds we found an open table and were served briskly enough. The food was ordinary but the important thing was that we were fueled for the evening ahead. As we were finishing dinner the sun descended rapidly and revelers in white began to fill the streets. In the square in front of the Old Castle of Bayonne a band was playing and circles were starting to form for a traditional dance. Much as I would have liked to stay on the edges of the festivities, Cleo kept pulling me with her into the circles and I stumbled as best as I could through the dance. Despite us not being dressed for the occasion, the locals were very welcoming and forgiving of my inability to keep up with the steps. We drifted from the square back through the narrow streets of the old town to the edge of the river, where thousands of celebrants were congregated. This was the River Nive, a tributary of the Adour which splits the old town and is traversed by several brightly lighted bridges. At this point the crowds, while good-natured, were becoming thick and inebriated enough that we realized it was no longer a great idea to wander around with the kids. We got them back to the carnival as promised and let them all play for a while on the bungee trampoline before heading back to the car and the quiet of Boucau. In the morning the kids were clamoring to go back to the carnival. I briefly considered it but Mei Ling wanted to press on and ultimately I decided she was right. This gave us some time to kill before we had to be in San Sebastian and some quick research revealed that the covered market in Biarritz was open on Sunday. This was quite unusual in France and Spain, to the extent that I planned our itineraries to minimize the effect of Sundays on our market experiences. Interestingly enough, I'd looked into Biarritz before the trip and made a conscious decision to skip it. I got the impression it was a rather bland resort town that had seen its best days a century earlier. Nevertheless a market was a market and it was just fifteen minutes from Boucau. Biarritz was a decent enough town with some attractive old buildings and plush mansions, but nothing that would have attracted us to the town outside of the market. At one point we were admonished for allowing the kids to ride some colorful plaster sheep outside a boutique. I couldn't imagine what else they were expecting when they put the sheep out there. As soon as we entered the market I was thankful that Mei Ling had talked me out of going back to the Fête that morning. It wasn't the largest covered market we had been to during the trip but it was packed with vendors displaying the freshest produce and countless gourmet delicacies. The cheese counters were especially amazing, with several varieties I'd never seen before. Behind the main market was a smaller building devoted entirely to seafood. The covered market was lined on both sides with crowded cafes and tapas restaurants. The circulation of people in and out of the restaurants and through the market infused the area with high energy. We selected a tapas place with a very appetizing seafood menu and had a delicious lunch. Biarritz had put a fantastic exclamation point on the nine day French segment of our road trip, but it was time to return to Spain for our journey along the northern coast to Galicia. We returned to the car and set a course for San Sebastian. Thanks to our prolonged visit to Chateau de Bridoire, we didn't roll into St. Émilion until mid-afternoon, too late for lunch at any of the more heralded restaurants in the center of town. The name had been such a mainstay on the wine bottles that populated my father's cellar that I expected a reasonably sized city. As it turned out, there wasn't much of a town outside the small medieval center. After being turned away from all the restaurants we tried in the side streets, we eventually found a tourist cafe in the central square in the shadow of the imposing limestone church. The best I can say about the food is that it was edible. We only had a few more minutes to explore St. Émilion's pretty cobblestoned streets, as our Airbnb host in Bordeaux had imposed an early evening deadline for our arrival. Our annoyance at having to rush our drive to Bordeaux was compounded when our host wasn't there to meet us. After a few minutes of futile doorbell-pressing and knocking I decided to call him, at which point he seemed surprised to hear we had arrived. After another fifteen minutes he drove up and as best as I could understand he had gotten the impression we would be arriving later. This was quite ironic as we would have loved to have arrived later and he had insisted that we absolutely had to be there by six. All of our prior communications had been through the Airbnb app and seemed crystal clear to me when I reviewed them, but perhaps something had been lost in translation. There turned out to be quite an extensive list of rules and precautions at the apartment as well, made all the more frustrating by the fact that French is not my strongest language and our host didn't seem to believe in pacing his speech. Eventually we managed to shoo him out and we turned our attention to making the best of the rest of the evening. Our central location proved to be ideal for exploring Bordeaux. We were just a couple of minutes walk south of the Porte d'Aquitaine, one of the more recently constructed of the eight city gates of Bordeaux. The arch stands incongruously at the northern end of the expansive and bland Place des Victoires. Its only companions in the square are a pink marble obelisk that celebrates winemaking and a gigantic bronze tortoise whose significance was lost on me. The lack of traffic in the large, open square creates a false sense of security for those unfamiliar with the area. If one doesn't pay close attention to the tracks, one risks being turned into paté by one of the frequent tram cars that whisks silently through the cobblestones. 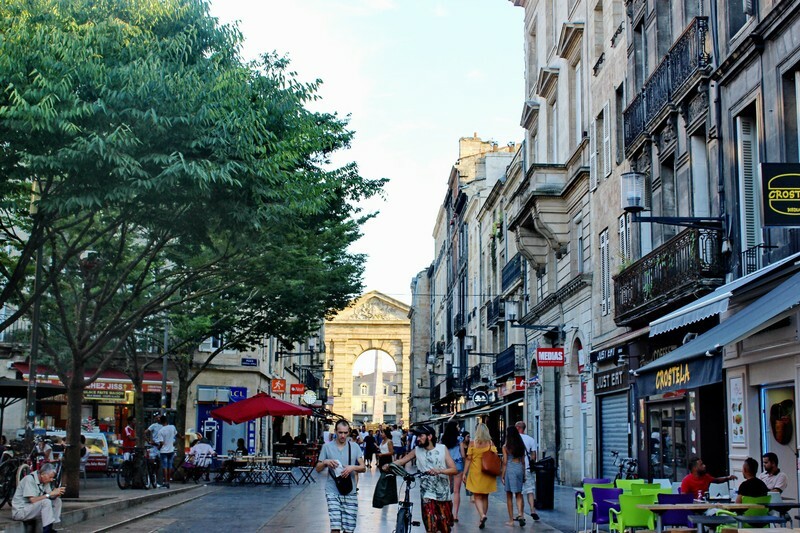 Aside from imbuing Place des Victoires with character, the Porte d'Aquitaine is also the threshold of Bordeaux's main pedestrian thoroughfare Rue Sainte-Catherine. This gritty, throbbing commercial artery courses through the heart of Bordeaux for a dozen cafe and boutique-lined blocks before it terminates at Place de la Comédie. 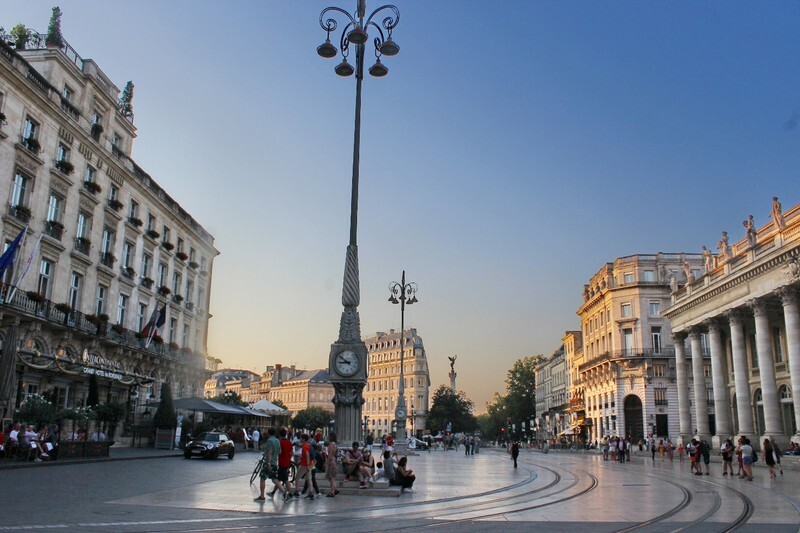 Place de la Comédie is the quintessential central square of a major French city. It is the home of the magnificent Bordeaux Opera House. the Grand Hôtel de Bordeaux, the obligatory colorful carousel, and a giant rust-colored statue of a human head. To the north we could see the tall column of the Monument aux Girondins in Place des Quinconces. A right turn down the stately Cours du Chapeau-Rouge brought us to Place de la Bourse at the western bank of the Garonne. Close to the river's edge is Le Miroir d'Eau, a water fountain the size of a soccer field that intermittently fills with water and drains dry. The fountain is famous for its reflecting surface, but between the gathering dusk and the ripples from all the splashing children there weren't many reflections to be seen. On the opposite side of the fountain from the river is an imposing semicircle of 18th century municipal buildings that are currently mainly used as a convention center. The kids were quite annoyed with us for not having had the foresight to bring their bathing suits, but we much preferred not having to deal with soaked kids with the sun dropping out of sight and dinner still ahead. We opted for the drier alternative of watching a funny and energetic breakdancing crew put on a show next to the fountain. One of the things I enjoy most about being in the center of large cities is the chance to watch street performances, and hip hop dancers are usually the best shows. This particular group did a great job of working humor into their routine and it felt good to drop a sizable bank note into the hat they passed around at the end of the show. We meandered through the center of the old town looking for a place to have dinner. The streets were surprisingly gritty with a large number of fast food and cheap ethnic restaurants. The pubs were already starting to draw crowds and it looked like downtown Bordeaux was a place for heavy drinking on most nights. The best place we could find to eat was a Japanese restaurant where the friendly owner chatted with us while we wolfed down an unexceptional meal. On the way back to the Airbnb, the tourists and shoppers were gone from Rue Sainte-Catherine. Instead there was an array of panhandlers, derelicts, and a few hoodlums gathering in the shadows. I herded my brood back through the darkening city with my head on a swivel. I was surprised that in a city the size of Bordeaux I was only able to find one daily produce market. 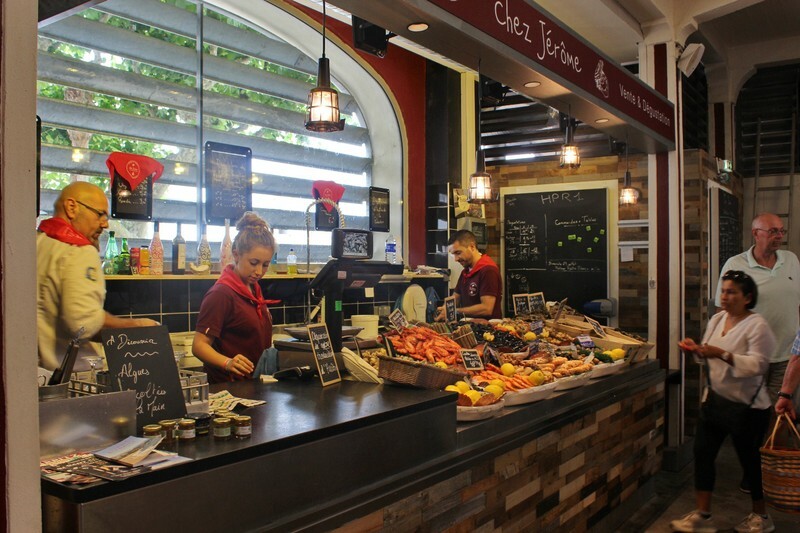 However, the Marché des Capucins seemed to be very well-regarded as a destination for Bordeaux's renowned chefs to purchase their fresh ingredients. We enjoyed a quiet walk through a pretty, residential neighborhood of Bordeaux on the way to the market. I'm not sure exactly what we found lacking at Marché des Capucins. Perhaps our expectations were just too high given the gastronomic reputation of Bordeaux. The physical plant of the market was uninspiring. It felt like shopping in a parking garage. There was certainly an attractive selection of the usual standards, but very little that wasn't familiar. Even little Pau had had a more tempting assortment of prepared foods. There were several small restaurants in the market and we eventually settled on Moroccan cuisine, which proved to be a pleasant change from the endless magrets we had been having in the Périgord. I had heard there might be another daily market in the square around the Basilique Saint-Michel but once we arrived is was clear that it was purely a flea market with no produce to be seen. The basilica was an impressive sight, standing alone on the eastern side of the square. We gave up on the idea of markets and walked around central Bordeaux for another couple of hours. The center was pleasantly busy and colorful with some dramatic medieval edifices like La Grosse Cloche. Once we'd made it back to Rue Sainte-Catherine we knew we had seen the bulk of what we would find interesting in the city of Bordeaux. It was still early afternoon so we spontaneously decided to take a drive into the Médoc wine country and look for new adventures. Anyone who has done a fair amount of traveling starts to understand the enormous significance of rivers. Historically, rivers have performed a similar function in civiization to the circulatory system of an animal. They have transmitted nourishment and commerce from the coasts to the heartlands and back since long before roads usurped that role. When I think of many of the world's greatest cities, one of the first things that comes to mind is the river that sustains it. 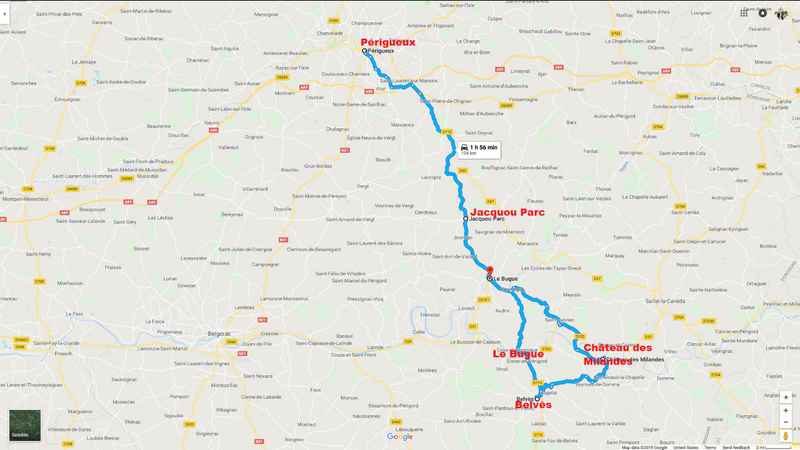 Southwestern France has two great rivers, the Dordogne and the Garonne, and Bordeaux is where these two legendary arteries come together and begin the process of emptying into the ocean. The Gironde estuary, which begins at the confluence of the rivers, is a gaping slash in France's Atlantic coast. Half river and half ocean, the estuary is responsible for the deposits of mineral-rich silt on the western bank which caused the Médoc to become the most acclaimed wine region in the world. I half-expected to be welcomed into the Médoc by satyrs and nymphs playing panpipes at the roadside, but the drive was relatively flat and nondescript. Naturally there were countless wineries along the way but I didn't know enough about Bordeaux wine to recognize the individual producers. We decided to press ahead until we reached the names that anyone with a passing familiarity with wine would recognize, Lafite Rothschild and Mouton Rothschild. The Rothschild family has been producing wine in the Médoc since the mid 19th century, with a vigorous rivalry between the two branches of the family. We had flirted with the idea of scheduling a tour of a winery with a tasting before our trip, but eventually decided that our three little beasts were too much to inflict on such a distinguished place. We've had some of our better experiences just winging it anyway. We eventually passed through the pretty coastal village of Pauillac and found the small road marked as the entrance to Château Lafite Rothschild. It was close to five in the afternoon and we were able to drive right into the vineyards without a single sign of human activity. We eventually pulled over among the vines and got out to examine the grapes. They were plump and shiny and just beginning to ripen. We sampled a few of the ones which had already tuned purple, which was as close as we were going to come to Lafite Rothschild wine that day. Down the road we encountered some rose-hued warehouses and floral gardens, but still no sign of people. It appeared they had already shut down for the day. Back in Pauillac we visited the Maison du Tourisme et du Vin, where there were more attendants than customers. Here we finally found our tasting, so we didn't have to depart the Médoc completely dry. 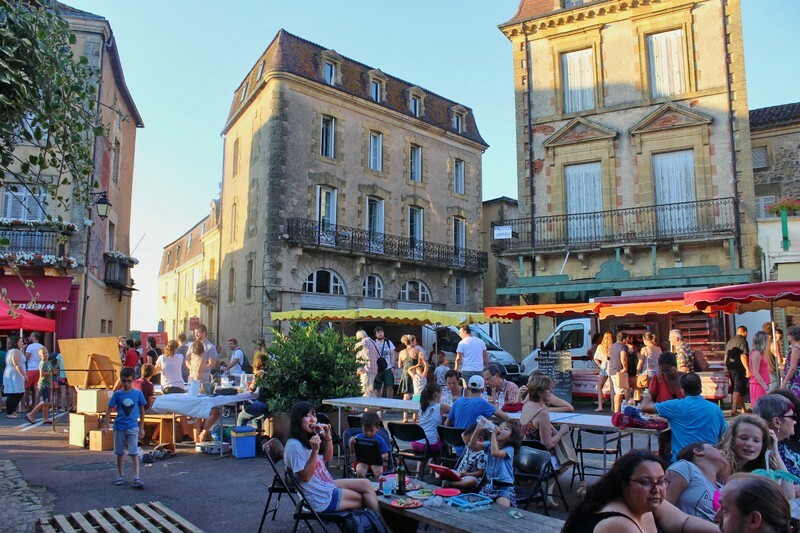 Bordeaux isn't known for night markets, but fortunately our experience in the Périgord had motivated me to do some online investigation and I found one. Saint-Macaire is a village on the Garonne well to the southeast of Bordeaux. Between the drive and a surprising difficulty finding the old town once we arrived, it was almost two hours between Pauillac and the night market. Fortunately the experience proved to be well worth the effort to get there. A short walk through ancient limestone houses took us to an open courtyard filled with communal tables. The food selection was as good as at Montignac, the best of the night markets we had visited in the Périgord. The kids were full of pent up energy after the long drive and had a blast racing around the perimeter of the market and dancing to the live band. Everyomne was exhausted by the time we finally arrived back in Bordeaux. Despite having had only two days in the city, we felt like we'd gathered the essence of the city and the immediate surrounds. The next morning we wasted no time and got on the road immediately for Cap Ferret. I had come across mentions of Sarlat-la-Canéda several times in my research on the Périgord, but somehow came away with the impression that it was just another of the many pretty little villages in the region. The Saturday weekly market was supposed to be one of the best, but we would be long gone from the Dordogne by then. I figured that a quick visit for an hour or so before the night market we'd chosen would be sufficient. In the end we didn't have a choice. Parking close to the old town was nearly impossible to find and I was eventually forced to use a space that was limited to thirty minutes. The southern entrance to the old town is via Rue de la République, which is an attractive but fairly typical commercial street for a touristy French village. It wasn't until we ducked down one of the many little alleys into the eastern side of town that we were able to see what made Sarlat so notable among the small cities of the Périgord. We found ourselves in a series of small cobblestone squares that were enclosed by buildings made of the same weathered brown stone that was typical of the region. However, the buildings in Sarlat were substantially taller than in other villages and boasted more medieval features such as turrets and carved stone facades. This part of the town was hilly and wide paths ascended in several directions to the periphery of the town. The effect was imposing and austere, yet somehow warm and energetic at the same time. It was very easy to fall in love with Sarlat and I soon regretted having compromised on the amount of time we would be able to spend there. In the main square we encountered a street magician setting up for his performance, which proved to be quite professional and entertaining for the kids. They were pained to be extracted from the show before it ended but I didn't want to spoil the mood of the evening with a hefty parking fine right before the night market. The vitality of Sarlat seemed to emanate from the right combination of tourist development with the historic beauty of the town. It was clear that I'd made one of my rare itinerary mistakes by staying in Bergerac rather than Sarlat. The night market at Saint-Amand-de-Coly was just a couple of miles from Montignac. I'd chosen it because I'd never come across the town's name in all my research and I hoped to have the same good fortune as we had the previous night. The village was tiny and pretty, although it didn't have a river to make it as warm and charming as Montignac. The night market was also very local though, with a lot of kids for ours to play with, and we were very pleased with the atmosphere. At some stalls one could buy raw and marinated meat which could be grilled to order at a nearby pavilion. Wednesday morning was fairly easygoing as the major weekly market in the area was in our home base of Périgueux. It only took us a couple of minutes to climb up to the large square in front of the grand and ornate Saint-Front Cathedral. It was a very functional market with a lot of variety and much less of a touristic nature than Issigeac or Le Bugue. It was perfect for us because our focus was on assembling the ingredients for a delicious market brunch at home. Our prizes were plump St-Jacques scallops, magret stuffed with foie gras, freshly baked bread, and plenty of flawless fruits and vegetables. The scallops, magret, and red peppers ended up sauteed in their own juices. We complemented the meal with a bottle of excellent Bergerac wine our gracious host had left for us. On the previous two days we had passed a water park on our way to our destinations near the Dordogne and hadn't given much thought to it. On our last full day in the Périgord, we didn't have quite the same appetite for the remaining villages and châteaux on my long list. We decided we'd give ourselves a break and give the kids a treat and spend the afternoon at Jacquou Parc. The kids loved the water park, although naturally they scattered in different directions meaning that the whereabouts of at least one of them was always unknown. Fortunately we averted disaster in the water and took them on a couple of the park's creaky and antiquated rides. By the time we had collected ourselves, it was already closing time for most of the sights in the area. We were delayed another half hour when one of the other departing patrons needed my help jump-starting her car. We decided to head to the former residence of Jospehine Baker, Chateau des Milandes, despite it being unlikely we would arrive before the closing time. On the way we passed through Saint-Cyprien where the streets were festooned with garlands in preparation for some sort of flower festival. We had hoped to be able to at least walk around the outside of the Chateau des Milandes if we arrived after closing. Alas, when we arrived at the château we found the gates shutting behind the last visitors and a tall fence surrounding the grounds. I was only able to manage one photo from outside the fence. 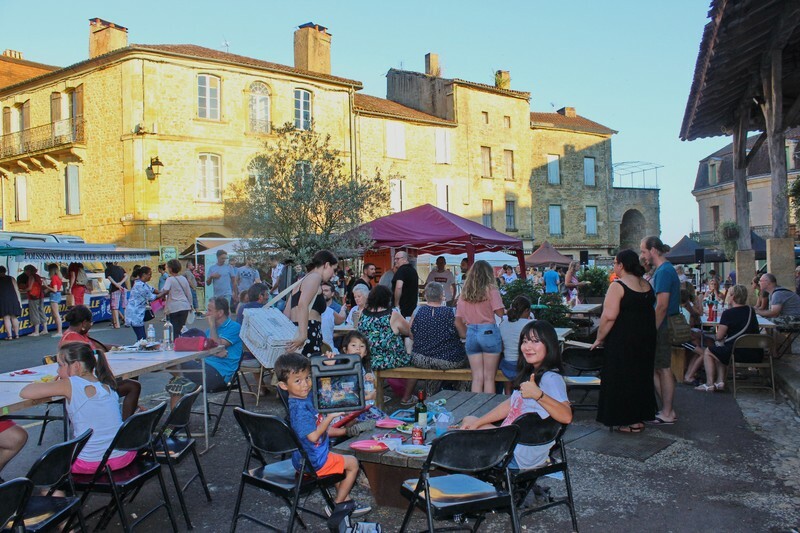 We had chosen the Wednesday night market in Belvès because the town was well-known for its exceptional beauty. We arrived late and had some difficulty finding a place to sit. The food was fine but the patrons were almost all tourists and the atmosphere was nowhere near as congenial as the previous two nights. We missed the live music and dancing as well. We had seen posters advertising a circus in Le Bugue that night so we decided not to linger over dinner. The Cirque Ullman was tiny but had a magically antiquated atmosphere that made me feel like it could be any moment of the 20th century. Older kids might have been skeptical of the limited acts but ours were thoroughly entertained. Between the markets, the water park and the circus, Mei Ling and I felt like we'd given the kids as good a day as anyone could imagine. On our last morning in the Périgord we had one final treat for the kids. Chateau de Bridoire is a restored medieval castle which specialized in family entertainment. There are lots of activities on the grounds and several rooms inside the castle largely dedicated to games. There were so many options that we eventually had to practically drag the kids out so that we would be able to make it to St. Emilion in time for lunch. The Périgord had been a spectacular stop for everyone. We had been extremely busy over our five days and I still had enough towns and activities left on the list to fill up another five days. Part of the nature of road trips is that eventually we have to move on, even from the places we love the most. Easing the sting of our departure was the fact that we were headed towards one of our most keenly anticipated stops of the trip, the region of Bordeaux.